How beautiful when your Sanford’s lawn shows off those gorgeous flowers surrounded by mulch. Every detail is in place. Like a perfect manicure! But do you know that a manicure is more than beauty? It’s the same with mulch. One of the most important components of a landscape is mulch. Mulch is any material placed on the soil surface to cover and protect it. By protecting the soil, mulch helps valuable plant material grow well. When mulch is applied we change the microclimate around the plants. Mulch conserves soil moisture in many ways. Due to our Sanford, NC weather, Mulch will reduce evaporation from the soil surface and reduces weeds that use water. Mulch holds water near where it falls, reducing runoff so that it can soak into the soil. Mulch breaks the impact of water droplets and slows down water movement to prevent soil erosion. 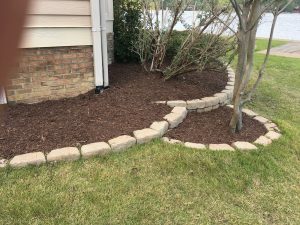 Mulch can be applied at any time of the year. The best time to apply it is right after planting and once a year to improve color and maintain thickness. Get the plants started off right by conserving moisture, preventing weeds, reducing compaction, and giving them all the other benefits discussed above. Get Your Estimate Now!